Superb work Chad, looking forward to see more. Just for clarification. My references indicate that the only lens for the vision ports on these were actually the lenses in the visors. In other words, the actual hole didn't have any kind of lens of its own. Is this correct? I have a small update for you guys. I keep finding small things in the front compartment that I want to change so just in the interest of not leaving anything out........ I made a small alteration to the seat. 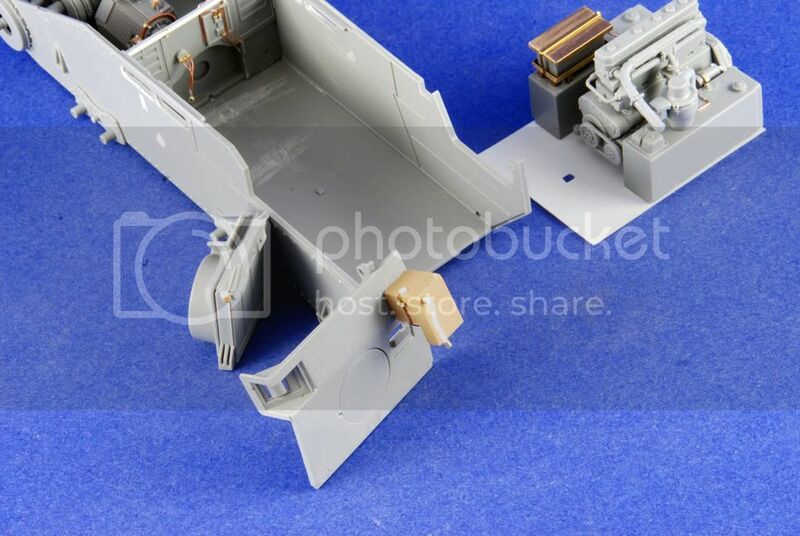 As I know the back of it can be seen through the hatch, I added a simple piece of styrene with holes in it and cut off the rear projection of the kit part (the super thick base part). The best I can figure, you can't actually see the kit part base so it's fine to leave as is but the rear part was visible before I cut it off and added this piece so I think it's a simple but effective addition. It adds a lot to the look of the somewhat clunky seat IMO. The next order of business was the engine compartment. My plan is to leave one side of the engine bay open and the other maybe only slightly cracked so you'll have very limited view in this area when it's all said and done. This started off with some deliberation as to how I could manage to add any wiring and other details and still be able to paint in there. The solution.... I decided to build a false floor that I could slide in and out. The engine mounts were cut out and I proceeded to insert the false floor and fit and glued in the fuel tanks and engine pieces. This way, in theory, I'll be able to work on the various assemblies in the compartment but will also be able to work on them in hand and can add some extra detail that would have been much harder otherwise. It fits in tightly but it will go in with some care. Obviously some of the wiring and/or hoses attach to the firewall and these are just suspended until final assembly. 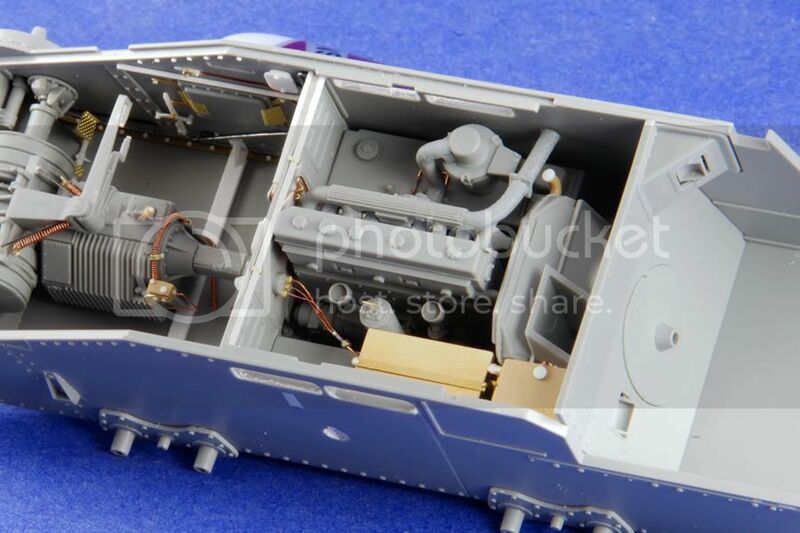 I also want to point out that this is by no means a completely accurate engine compartment and some of the thing that I've added were from references of a rebuilt 38t which may or may not be original. Most of this will not be visible anyway but I wanted to spruce it us as best I could. Keep in mind that the rear firewall and radiator are still floating so it's not exactly in its final resting place. 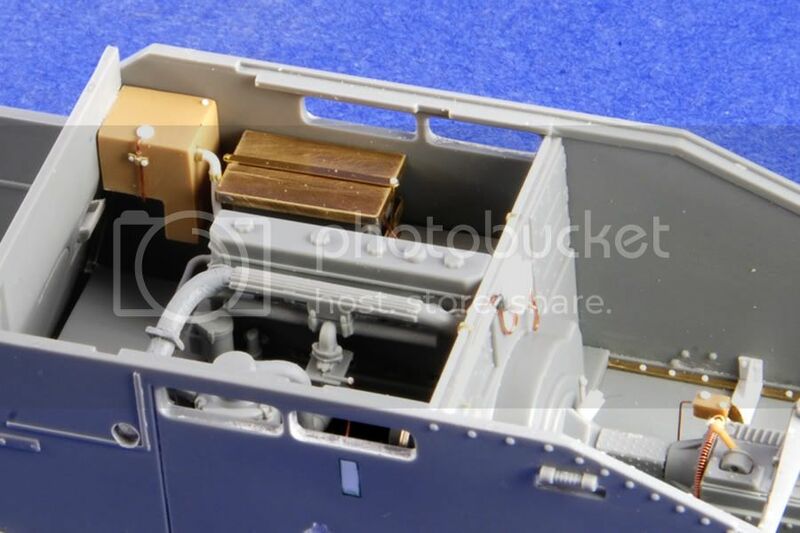 I'm not really sure what the tank is by the radiator unless it's some sort of coolant tank but it's there on the reference pics I have and also on the trumpeter kits so I figured I'd put one back in there. It's not shapped exactly as It's supposed to be but the part you can see when the radiator and overhanging gun platform are in place looks the part. I made this out of a spare panther rear stowage bin. I also added the filler neck to the radiator which is missing for some reason. Made that from part of a king tiger towing clevis. It's always fun to make something out of something else. For that reason alone, I have a big bag full of old spare parts. You can usually find something in the right shape if you look long enough. Just a little sanding and filing and there you go! Thoughts on my barrel situation........ I have the aber barrel already but the barrel length is not correct or at least not the same as the kit pieces that hold it in place so I have been searching for a suitable alternative. I think I can extend the length of it but I saw this armorscale barrel and the breach is much nicer than the kit piece and the quality of the barrel itself is on par with Aber (based on others I've used of theirs). The breach has the casting numbers in it and it's one piece instead of 3 or 4 like the kit piece. (See pic below) I'm sure I can find another use for the aber barrel if I can find a better replacement for it. 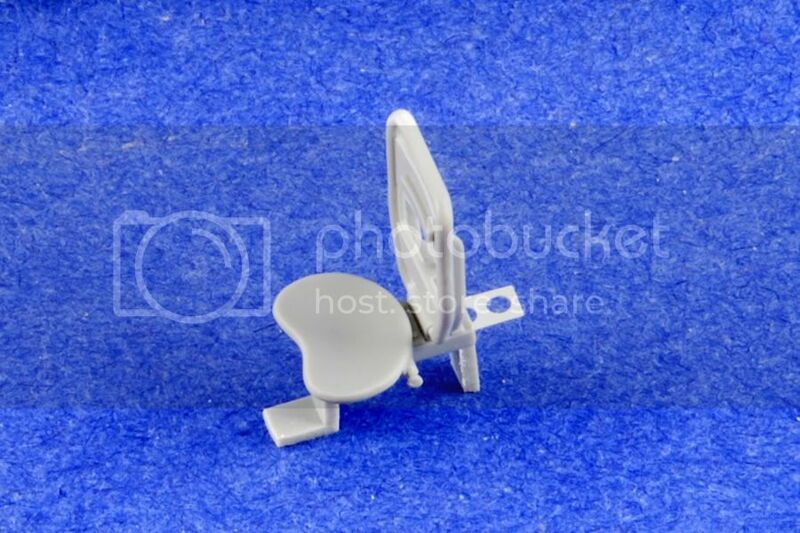 Anyway, the armorscale piece looks really nice but I am somewhat confused by the strap that holds the barrel down. This strap is not discernable in a lot of the reference pics that I have but since it mounts flush with the barrel I suppose that's not a big surprise. 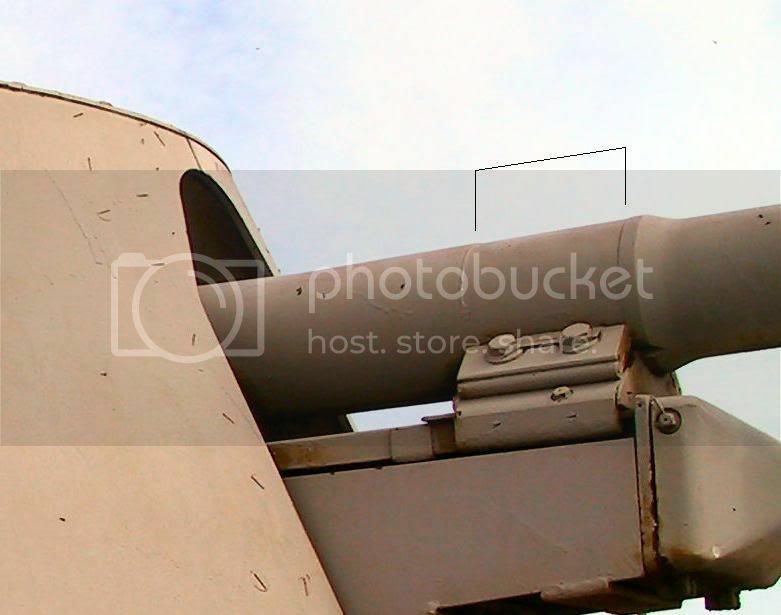 I could see how this could be indistinguishable on a vehicle that's been outside for a while or repainted a dozen times as it sits flush with the barrel but I have to believe that it's supposed to be there. As I am certainly no expert on artillery pieces, I thought I'd post this for your consideration. The attached pic of the aberdeen vehicle clearly has the groove for the strap but the strap is not there. 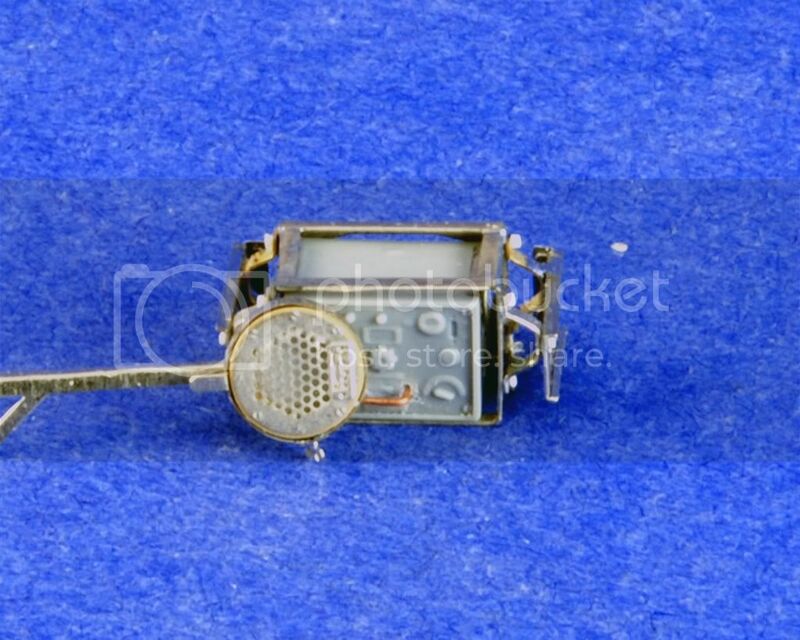 The next pic is of a field piece and you can easily see that the strap is present. I assume the marder used the exact same cradle as the field piece so it must have been there right? 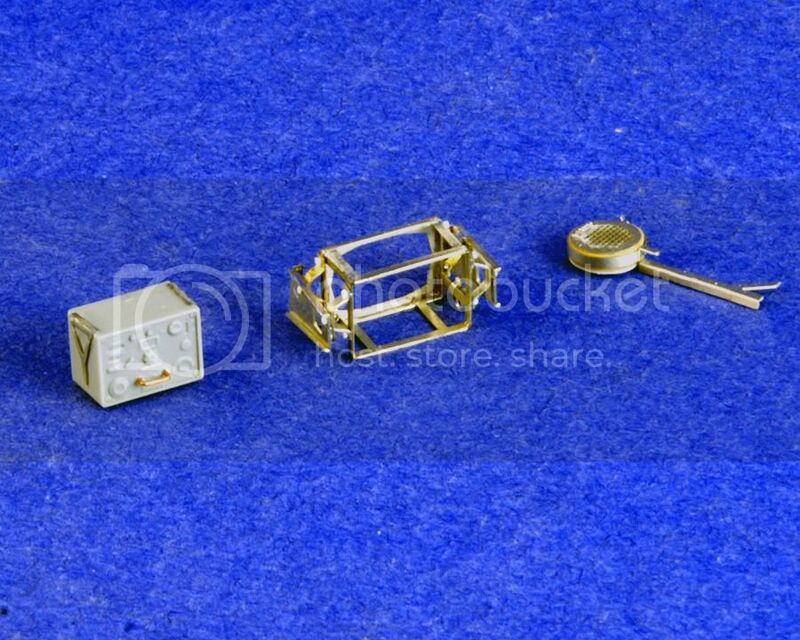 I'm just looking for some reassurance I guess as I've not really seen this present on any marders built by modellers and it's odd that the kit barrel has the groove for the strap but no strap so that makes me think it's at least possible that they just didn't have them. 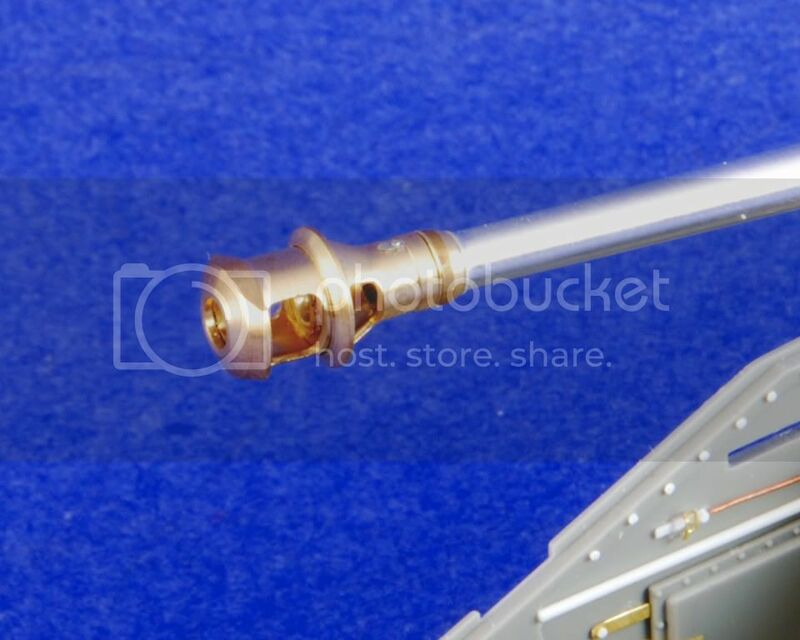 I want to use this armorscale barrel I just to be sure that it's appropriate first. 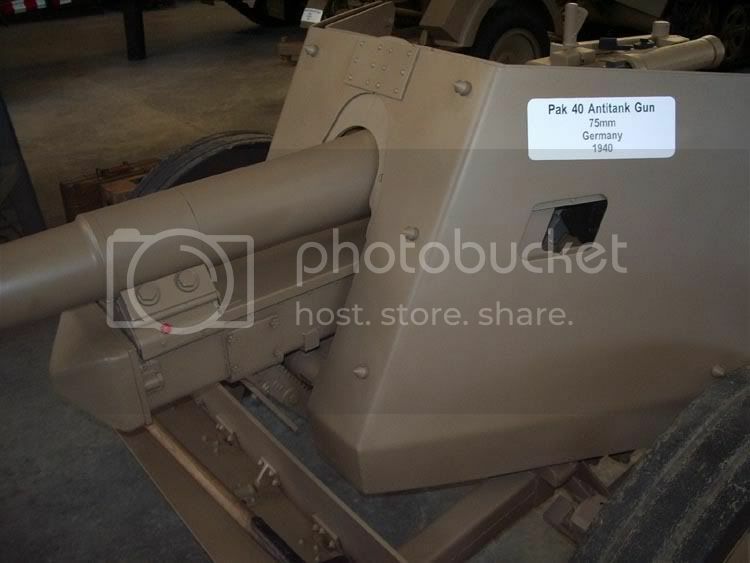 Also, just as a history lesson, what does the final number is the designation pak 40/3 mean (ie: the 3) I know there are /1's, /2's, /3's etc. so what exactly does that mean. 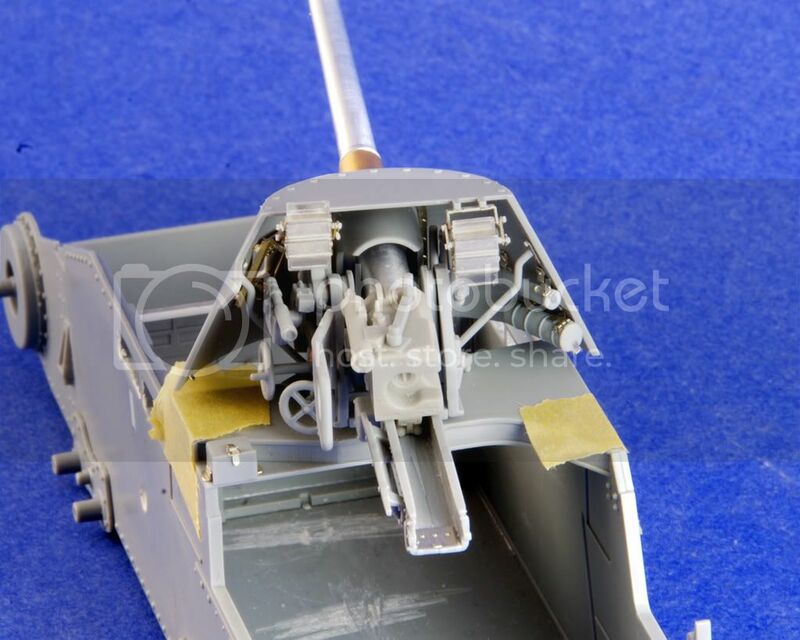 It's still a 75 mm pak 40 so are these different barrels entirely, muzzle breaks, some other feature? Just curious for my own benefit. 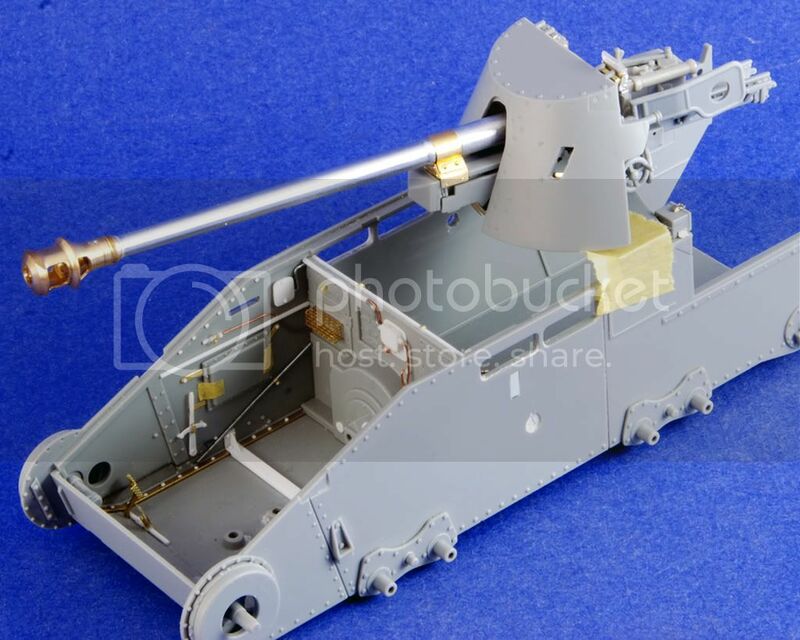 I notice that the armorscale barrel does not have a designation for /2 or /3 or anything else which would lead me to believe that the last digit has something to do with the inner workings and maybe not the appearance but I do not know for sure. 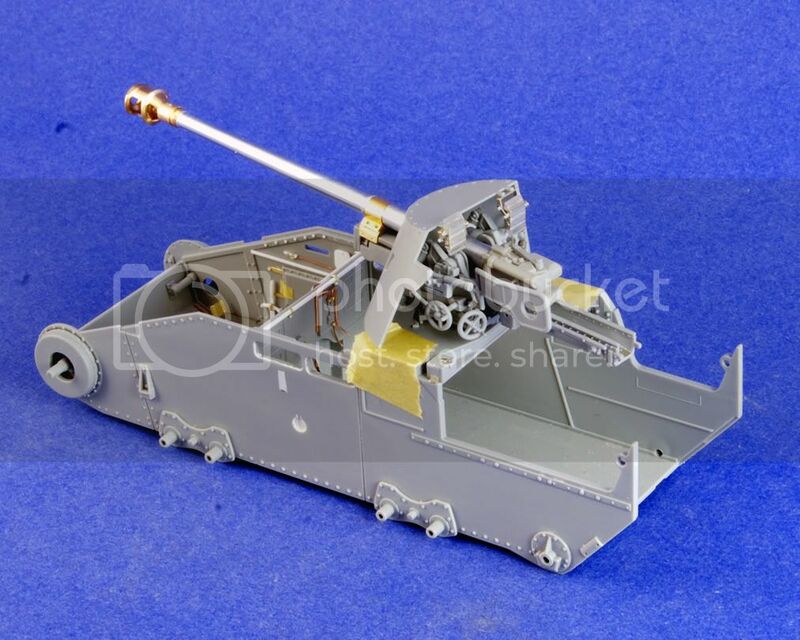 I do know that the vehicle pictured on the armorscale page along with the field gun is a marder II which used the /2 and I need a /3, what's the difference? Well, progress is slow on this one. 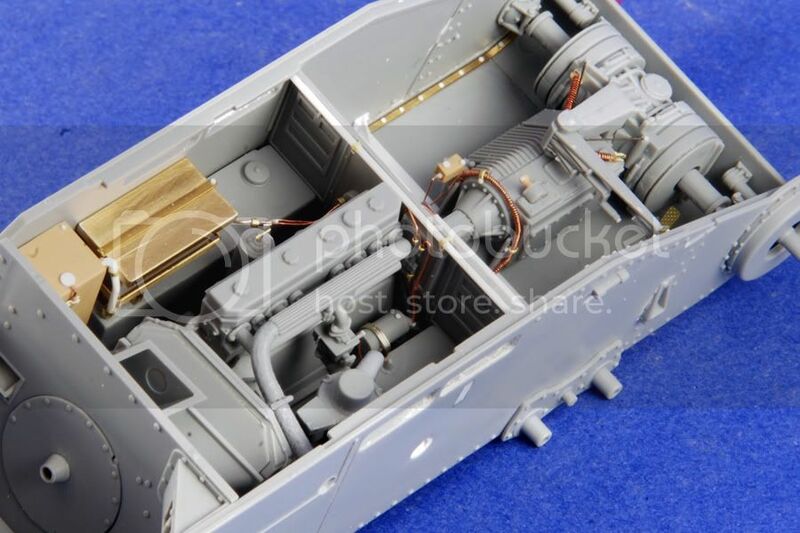 I'm trying to approach it as several different smaller kits (driver's bay, engine bay, gun assembly, left fighting compartment, right fighting compartment, exterior). I've notched a few of them off the list but many more left to complete. I've done some of the tedious work for a lot of the other parts just to break up working on one thing for too long so that should speed up future construction but my update for this post is the left side of the fighting compartment. No radio on that side so I decided to tackle it first. The vision block was a bit of a tester but I finally got it together, the other ones should be easier now. 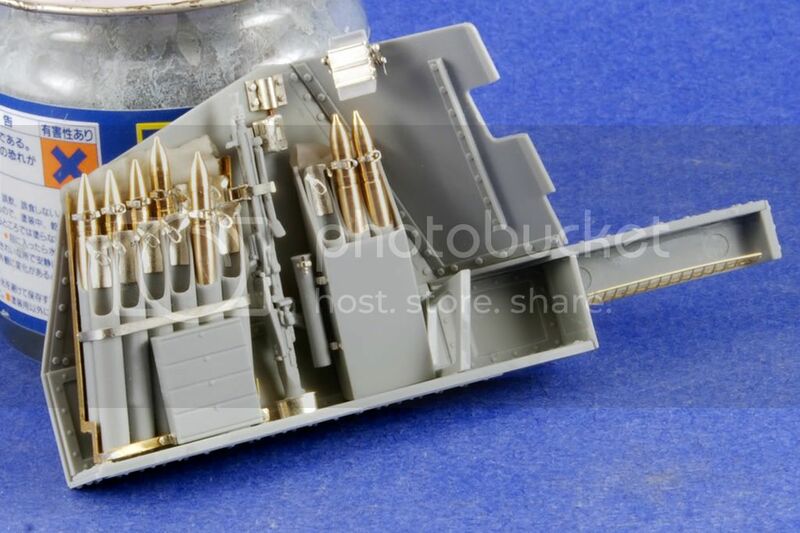 The ammo bins were thinned down considerably with a round file in order to fit the tamiya brass ammo rounds and they needed it anyway as they are really thick. The canvas covers are made from apoxie sculpt. I put them on all of the shell racks because on the other side I'm going to cover up the rear row completely with the canvas. I'm doing this for a few reasons...... but mostly because I'm running out of brass shells! They only give you like 14 rack shells to fill 27 racks so I needed to show some empties and cover some up? Anyway, it'll add a bit of interest and keep me from having to make 6 of those straps so I'm ok with it. This stuff is all a really tight fit in there and I still have to add the mask canister and seat and then the fire extinguisher to this side. It's all just laying in there now with no glue as I dont' want to glue anything until it's all test fitted and I may leave it all loose anyway for painting, having decided yet. Great eye to the details indeed,super build so far Chad! Well, progress is slow on this one. Chad -take your time mate, not a race- from the looks of it you've got a real champion going here- just enjoy the brass. Don't you love the brass ammo! I tuned in a bit late it seems, but from now on, I will follow your steps closely. Great work and some fantastic indeas! This segment was devoted to the gun and shield assembly. I went with the armorscale barrel and it's really nice. The barrel comes with the strap that holds it down to the cradle which is a really nice touch that no other barrels have molded separately that I've ever seen. Muzzle break is on par with aber and the one piece breach is really nice with casting numbers included. The only thing about these armorscale barrels that I've noticed (this is my second one) is that they aren't perfectly smooth from the lathing process. You can hold them up to the light and see the rings. This is easily sanded out but it's just something I've noticed about them. Anyway, beyond that, I spend most of the time making more of these vision block assemblies which are really a pain. I've made them so I can remove the blocks for painting but they are really a chore to put together. 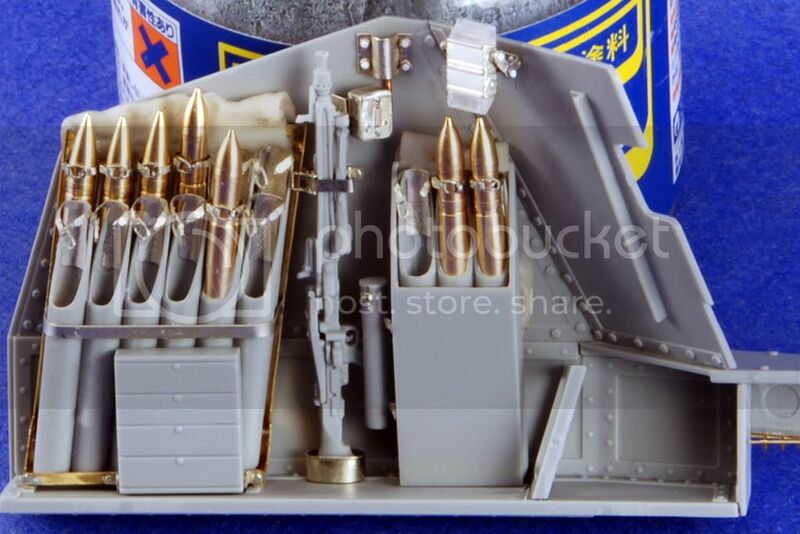 One thing I've noticed is that this kit doesn't have the little box in the center above the gun, should it be there or is that a later feature? Once I get some more progress on this side completed, I'll get up some more pics for you guys. I just can't get motivated to tackle that last rack of ammo but I'll get around to it. Anything to avoid the radio for a little longer. Oh yea, I did reverse the clamp on the mg as it was backwards.